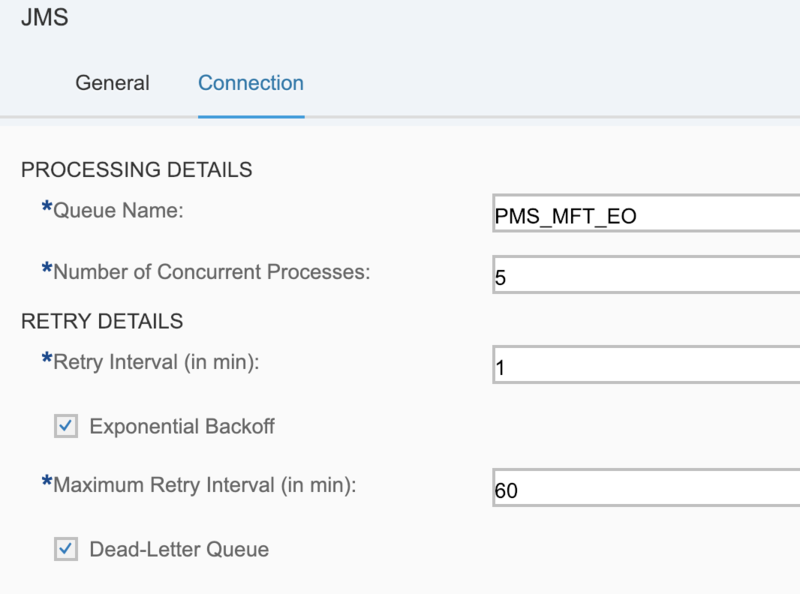 SAP Cloud Platform Integration does not store message payloads by default (queueing). In case an error occurs (mapping, routing, connectivity), we have to design the desired behavior ourselves. This document describes the available options. Of course it makes sense to add error handling for each flow (if you need iFlow-specific processing or alerting), but this is not discussed here. 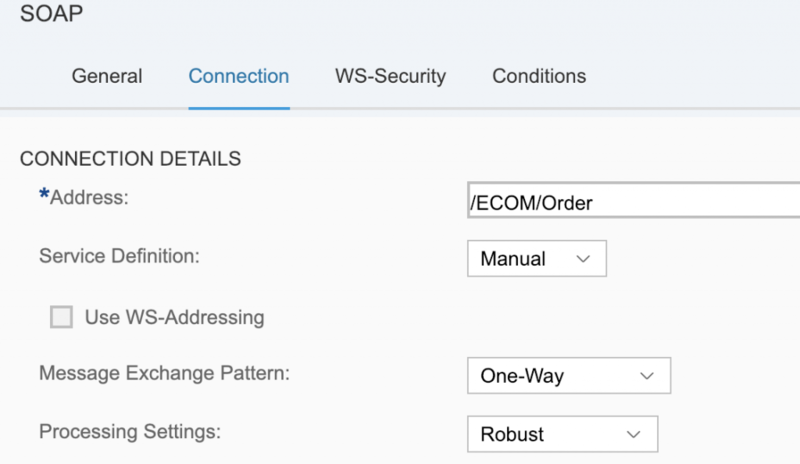 Please note that you can perform a monitoring with alert notifications outside of the iFlows using WHINT Interface Monitoring. For synchronous connectivity it is simple: The errors are immediately sent back to the calling/sending system. 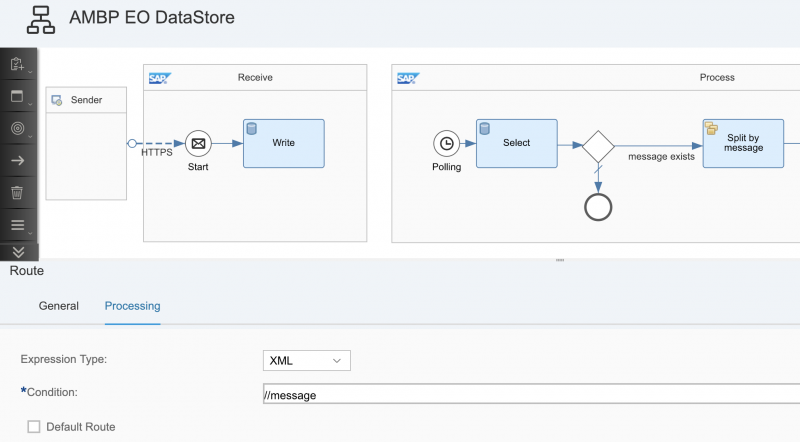 No persistency or message queueing is required as error messages have to be handled outside of our integration flows. You can change the processing settings to “Robust”. This will execute all steps of the iFlow in a synchronous mode until the message processing is successful. Then the sender will receive a HTTP 2xx code (OK). If an error occurs at any point, the sender will be informed through a HTTP 500 code (server error) and the sender must queue and organize the retry mechanisms. 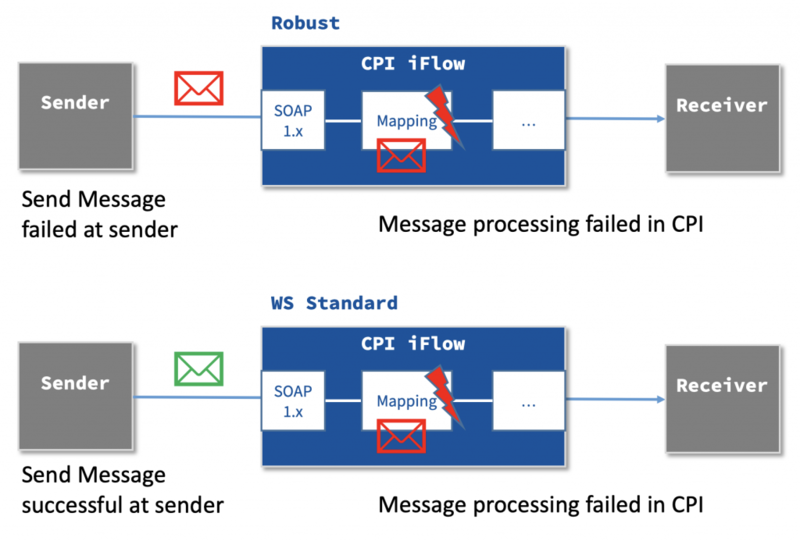 The alternative is processing setting “WS standard”: When the message arrives completely inside the iFlow, the sender will be notified with a success message and the CPI processing starts. If any error occurs and nothing is done to enable queueing/persistency, the message will be lost and no retry will be possible. (of course the sender system may be able to manually resend a message which was apparently already successfully processed). For Queues there is even a more convenient way, as JMS provides Dead-Letter Queues (DLQ). Messages which are failing repeatedly to be processed are moved automatically to a DLQ where manual actions can be triggered (e.g. notifying a responsible person). This is an internally used adapter, you can only send/receive messages though JMS queues within your CPI tenant locally. The approach is to persist all incoming messages into a queue first (with the unchanged messages) and then have a second Integration Process polling from the queue and processing the messages. Like this, the approach works like the XI or AS2 adapter, but with an additional Integration Process. Luckily this can be placed in the same iFlow. The messages remain in the queue until the processing of the message is successful. When other iFlows are called (via ProcessDirect adapter), you have to make sure that the transaction handling is using JMS, not JDBC. The only disadvantage is the limited number of queues (28) available… Setting this up for each interface will soon use all available queues. Using the Data Store we can also achieve queuing without the limitations above (we can have many, many Data Stores). The approach is similar to the JMS one, but we have to manage the processing more manually, see the example below. The Select Operation only supports XML. In case you want to transfer Non-XML (binary, text, ..), you have to Base64-encode the payload and add an XML tag around with a Content Modifier Step. The Select Operation reads the set of messages randomly (e.g. 100 messages), not using a FIFO approach. Like this, blocking messages can stop the interface entirely, even if some messages could be processed successfully. Metadata (e.g. source file name) would have to be stored in the entry id as the data store only persists the body.